Would give anything for a few years getaway, but you don’t know where to go? Maybe this Hotwire hotel offer will help you make up your mind: you choose from many different Fort Worth hotels and stay from $33 per night per person this winter. The offer is subject to sellout, so check the deal now and book before all the rooms are taken. All hotels are highly recommended by customers and are located in popular areas of the city – and they are really cheap too. 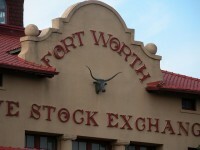 Texas is waiting for you with the best steakhouses, some of the best amusement parks and loads of other amazing things. As you may have seen, the hotel names are not published, that is because these rates are so low that hotels are not allowed to advertise them under their own names, so you can only get to know the area until right after the booking. By clicking a price you can get to Hotwire‘s deal page where you will see the rate without the taxes, but Metafares editor took the time to calculate the total price, so you won’t be unpleasantly surprised, so below you see some of the offers, to take a closer look, you just have to click a price. *Total nightly rate is the absolute total price with all taxes and fees. This entry was posted on Monday, December 12th, 2011 at 5:09 am and is filed under Hotel Deals. You can follow any responses to this entry through the RSS 2.0 feed. You can leave a response, or trackback from your own site.